…to my site, dedicated to my wonderful and loving family. I am a writer of many genres, including fiction and non-fiction. My successful kickstarter campaigns have allowed me to realize my publishing dreams. Get an Autographed copy, only $25! Price includes shipping and handling. You can still purchase an autographed copy of my book No Fear: Tales of a Change Agent or Why I Couldn’t Fix Nortel Networks! A full length work about my experience as a change agent at Nortel Networks. Not interested in the autographed copy? Get paperback or electronic version using your preferred method below. 1. Check out some pictures of me and my family below. 2. Head on over to my Book page, No Fear! 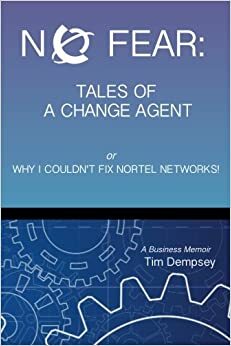 Tales of a Change Agent: Why I Couldn’t Fix Nortel, and get your copy from Amazon! 3. Come back and visit soon for new fiction and non-fiction publications! Ever since I was a teenager, I’ve said that I want to be a writer when I grow up. And I’ve done a lot of writing: journals, letters to editors, short stories, professional journal articles, novels, personal essays and now a business memoir. But I never made a lot of money at it so it was always on the side while I pursued other career paths. Thanks to Kickstarter, and all the generous contributors in my growing fan base, I had choice about how to get self-published. As I gathered information from a number of providers, it became relatively easy to select Createspace, now owned by Amazon. As I engage with them, they are proving to have efficient processes and tools, customer-focused capable staff and effective support all around. No Fear: Tales of a Change Agent, or Why I Couldn’t Fix Nortel Networks has been published and is available for sale from Amazon, Barnes and Noble.com and iBooks. Meanwhile, five and a half years after filing for bankruptcy a multinational trial begins mid-May to decide how to divide up the sizeable estate. The trial phase ended late June and the judges are sorting the testimony. They are going to hear arguments, again, in October before rendering a verdict.